Emily L. Gates 91 of Cedar Springs, went to be with her Lord and Savior on Saturday, February 13, 2016 at Metron of Cedar Springs with her family by her side. Emily was born June 15, 1924 in Forest Grove, MI the daughter of John and Elizabeth (DeKleine) VanOss. She was a loving wife, mother and homemaker who enjoyed handwork – knitting, crocheting and cross-stitch. 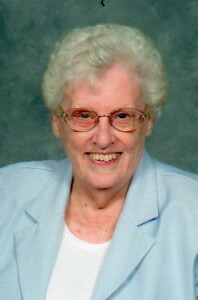 She was an active member of the First Baptist Church, Cedar Springs where she served as a deaconess. Surviving are her sons, Lohryn (Debbi), David, Dan (Carole), Karl “Johnny” (Vicki), Kevin (Valerie), Lance (Kim); 24 grandchildren; 24 great grandchildren; sister, Karen (Al) Kunzi; brothers, Howard Van Oss, Robert (Verna) VanOss; sister-in-law, Ruth VanOss; brother-in-law, Lyman (Joan) Gates. She was preceded in death by her husband, Ivan in 1975; sister, Dorothy (Robert) Crater; brother, Richard Van Oss; great granddaughter, Piper. The family will greet friends Tuesday from 2-4 and 6-8 pm at the Bliss-Witters & Pike Funeral Home, Cedar Springs. The service will be held Wednesday 11:00 am at First Baptist Church, 233 S. Main St. Cedar Springs. Pastor Dan Currie officiating. Interment Elmwood Cemetery. Memorial contributions may be made to the First Baptist Church Missionary Fund or Hospice of Michigan. Arrangements by Bliss Witters &Pike Funeral Home.